Boden has really caught my eye as of late with their fun prints and silhouettes that have a distinctively retro/vintage vibe. 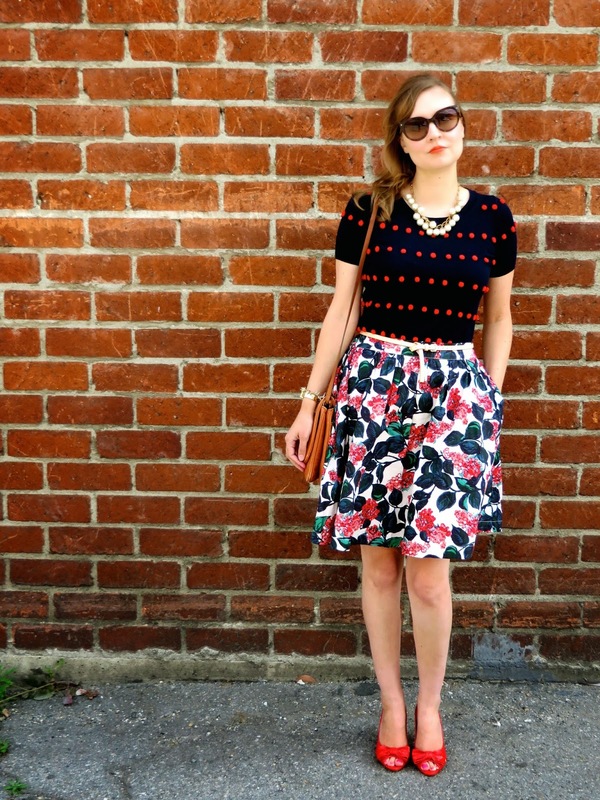 My most recent acquisition from Boden is this Florence skirt in what they call a "red vintage floral" print. 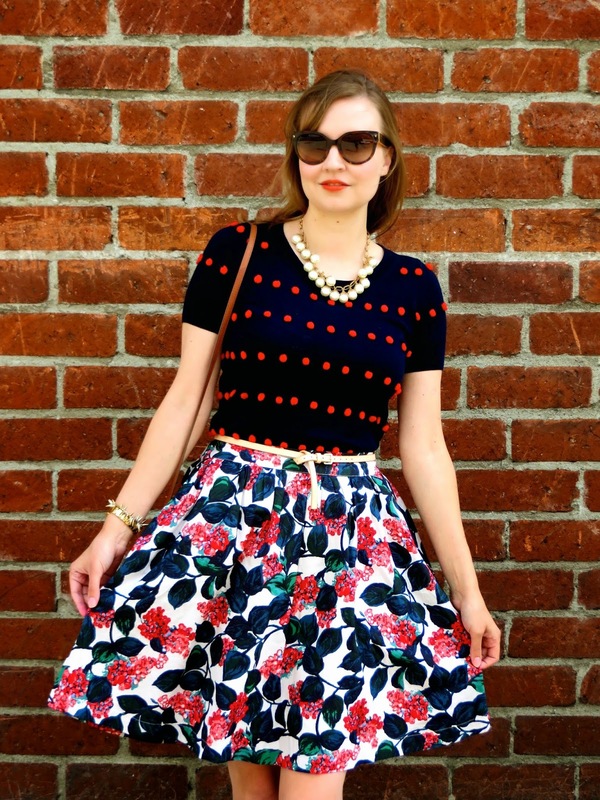 The skirt is lightweight, has pockets, and features an elastic waistband. I actually wish I had known that this particular style of skirt came with an elastic band (maybe I didn't read the fine print!) because I would have sized down, but actually, come to think of it, the smaller size wasn't available in this very popular skirt. In regard to styling, I was torn on how to wear the skirt, so I ended up combining two looks into one. Plus, the fact that we had a spell of rather unseasonably cool and rainy weather last week prompted me to layer. 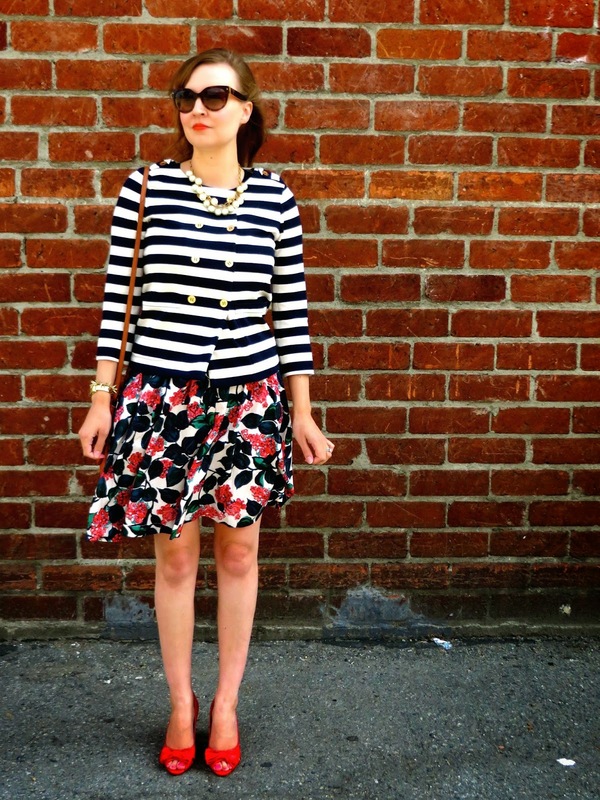 So below you will see my short sleeve Swiss dot sweater, paired with a nautical striped jacket over top. The looks aren't all that different, but hey, it's two looks for the price of one! What a lovely look! Love the mix of patterns!! Looks awesome! Your skirt and red peep-toe shoes are gorgeous. 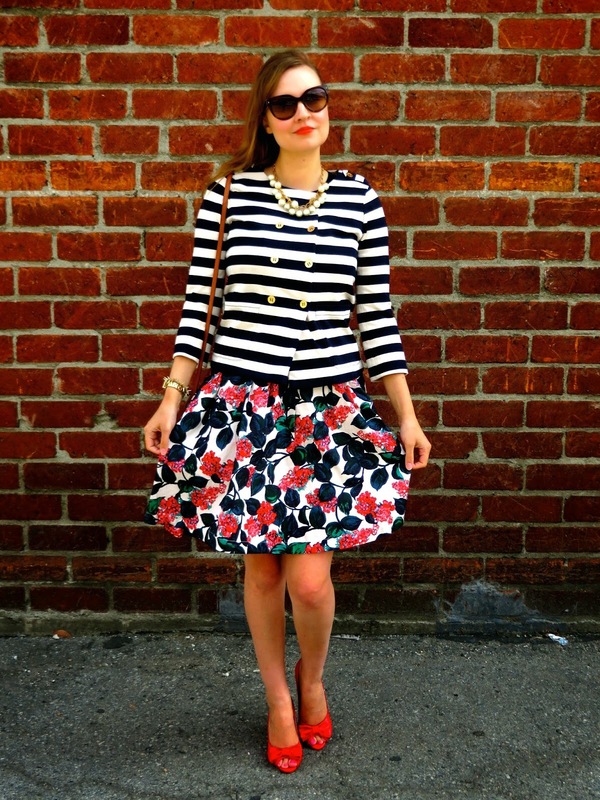 I also loe the pom-pom top and beautiful blazer. 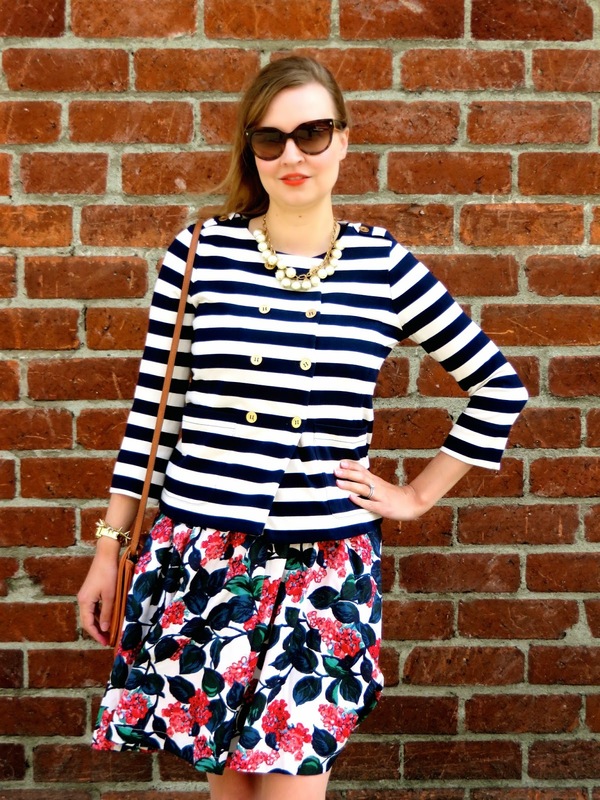 Super adorable print mixing, I love it! 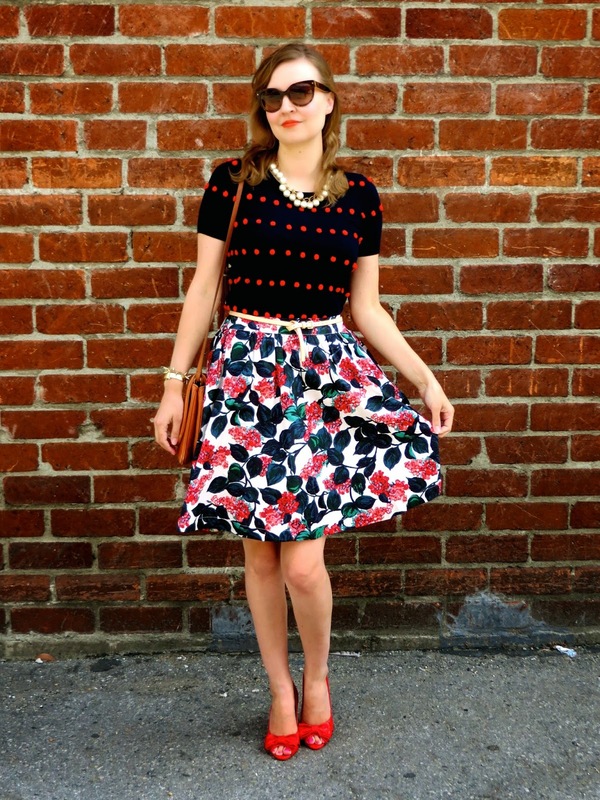 Who knew that a floral skirt could be this versatile?! I also adore that it has an elastic waist. That's going to be a must for those hot summer days!